Re:ZERO ~Starting Life in Another World~ Season 1 Part 1 contains episodes 1-12 of the anime series directed by Masaharu Watanabe. 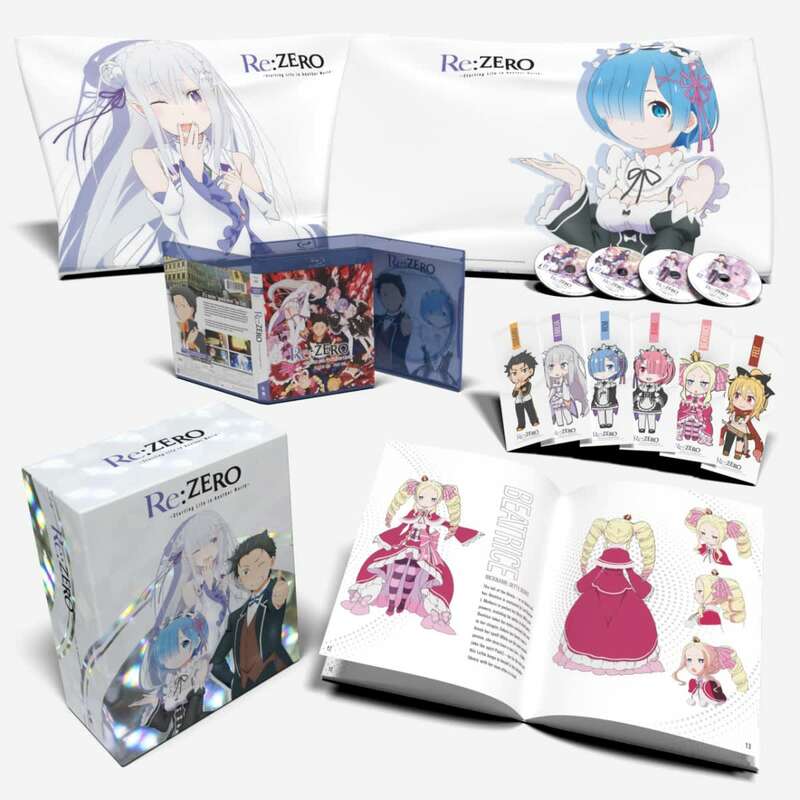 This Limited Edition contains a chipboard box with a specialty print, 40-page art book, 6 chibi bookmarks, and a 20" x 30" standard pillowcase featuring characters Rem and Emilia. The Anime Series was great. There is Adventure through this series but at the same time Dark Secrets that are coming forward through out this adventure of making the right decisions and learning from experience through out your Journey. Great Music and good timing through out the series of how to make a better decision to change a person's Fate. Very Good Trip to Another World but Poor Video Quality. Hello I'm here to say ReZero is shaping up to be a pretty good anime so far. Im enjoying that rocking opening, interesting characters, unnerving story, and a decent dub. What im writing this review for is to tell people to check their blurays and Dvds as there is poor video quality in certain scenes. Mainly the darker ones where there is noticeable banding on the characters. Im not sure if this is on every release of the show or just some. Im writing mainly to warn people to check their releases and contact Funimation/Rightstuf if needed. Other then that the show is shaping up to be something special but its too bad about the poor video quality on an otherwise very good anime. If you are considering buying this I would hold off just until it is addressed as I would want to own the best video quality for this show that I could. Re:zero fans beware, you're in for a disappointment. I can't believe I'm writing this about my favorite anime, but here we go. I am disappointed with this. Not because of the blu-ray extras, or the extra fun items contained in the set, or the size of the box, or even that it only contains half the season. Everything in the packaging is pretty much what I could've asked for for this release. EXCEPT THE VIDEO QUALITY OF THE BLU-RAY. I don't know who's job it was to master and compress the videos for the discs, but the 1080p Blu-Ray quality is worse on here than the original Crunchyroll stream, which, in my honest opinion, should not be happening. Considering this was one of THE most popular animes of 2016, this never should have happened. To FUNIMATION: you need to get your act together and start checking your stuff THOROUGHLY before you sell it. This is strike 2 for you. 1 more time, and you just lost a huge buyer of your merchandise. And I'm pretty sure I won't be the last. Although the Box Set looks cool and all, it feels a bit light. This is someone who has never bought a FUNIMATION Limited Edition before. Also, I hear that the discs have banding issues which maybe a problem for those who were expecting this release to look better than the streaming version but I don't mind that at all. Even though I'm a bit biased on this review, my final rating is 3 Stars. First off I love Re:Zero and I was excited to finally own it and support the blue ray release. It saddens me to say that this just isn't worth it not in the slightest. I'm not the most technical person when it comes to Blue Rays so I probably can't explain it in technical terms properly but I'll do my best because it's obvious this release has issues. What I have noticed so far: Dark scenes(this includes when a character is in a shadow area) aren't even truly dark, but more of a "flashy" mess of pixels that I assume comes from compression. Faces are also another area I noticed have these issues. There is already a PSA over this release and it's accurate. I feel like i paid the money for a pillow cover, bookmarks, and booklet because it certainly didn't come from the blue ray quality. If you really must buy it no matter what please research before buying. You may come to that the quality doesn't match the price. Wonderful series and the extras in this limited edition are pretty cool. The problem is the video quality. There is major color banding in a majority of the scenes. Not what I’d expect from a funimation release. It’s pretty disappointing, especially because we’ve been waiting since 2016 for a Blu-ray release. I hope funi recalls/replaces the discs when they get this sorted out. Other than the atrocious video quality which Funi still hasn’t addressed, the LE is decent overall. This is one release where I wish Funi had packages the extras outside the artbox (like Overlord) imo. At least there’s a filler box for part 2 when it releases (with non crappy video hopefully) unlike MHA S2. Now to sit back and cross my fingers Funi actually decides to do something with this fiasco. Nice LE set, great anime must have! I love the packaging and content but the the blu ray video/footage has a lot of banding issues. Be warned. But this is one of my best favorite series recently so definitely wanted it on blu ray! So Blu-Ray video quality is the big discussion here.. I can't say I see the problem on my setup. Kinda hard to miss Banding on 65" TV and it's not there.. I think the Internet Rumor machine is now running rampant, there may have been an issue or there is still an issue.. but regardless my set was fine. Great Series.. and waiting on Part 2. I watched this a few months ago with some friends and I'm a little disappointed in myself for buying this since it does have a noticeable amount of color banding in a lot of scenes, but this is all there is currently when it comes to the (bad quality) blu ray release, hopefully Funimation can fix this later on in the complete blu ray version or sooner. I love the holographic box of this limited edition. It comes with one regular size pillow case with Amelia on one side and Rem on the other. I love the art book that comes with it and all 6 character bookmarks. It also has 11 shorts that are subbed. 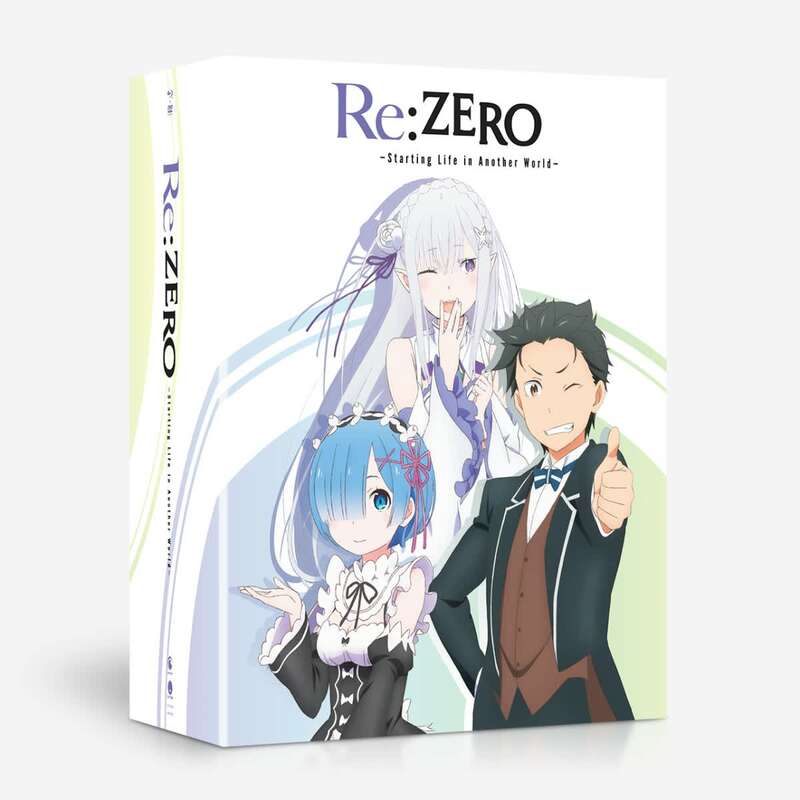 Thank you Rightstuf for my wonderful Re:Zero Limited Edition. Video quality excellent, story great, characters terrific, voices spot on. A great series for old school RPGers who wanted a quality series that captures the magic of playing a game without all the grinding. I've watched the full series in Japanese and can't wait for the 2nd part dubbed release. It gets even better! Sorry there wasn't more but the anime series that I begin to like usually end quickly.